Red Pistachios! Where Did Those Chemical Nuts Go? I am not sure how I really feel about Facebook, however one thing is certain. Every now and again I pick up something in my news feed that reminds me of something from when I was younger. A while back I started a category called generation X I figured since it’s my generation I’d have tons to talk about. Well I really haven’t thought about all that much to talk about actually. Makes me wonder how exciting my generation was. We didn’t have any world wars. Video games! We had video games but that’s for another post. My love affair with Pistachios started when I was 5. My mom and grandmother use to buy them by the bucket load. They where shiny red and they made a mess everywhere. Not until recently while on Facebook did I even remember that I ate red pistachios. The image of them made all these suppressed images come flooding back to my mind like it was yesterday. So where did all the red ones go? Well I found out that they were being produced in the middle east. Back in the day the way they harvested Pistachios made them look very unappealing so they dyed them. I don’t think the dyed versions where very healthy since they used dye on them. But back then nobody wore seat belts either. 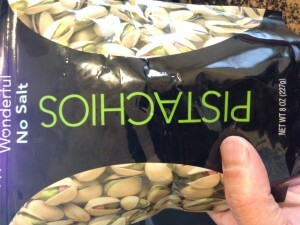 Today most of the Pistachios we get today come from California so I hear. So while it’s true anything eaten in excess is probably not to great for you. Pistachios are a great source of health food goodness. Vitamin B6 – Good for cardiovascular, digestive, immune, muscular, and nervous system function. Managanese – Good for healthy bone structure, bone metabolism, and helping to create essential enzymes for building bones. Potassium – Good for healthy bone structure, bone metabolism, and helping to create essential enzymes for building bones. Phophorus – Is an essential mineral primarily used for growth and repair of body cells and tissues. Pistachios are a good source of Antioxidants, that’s why they are colorful and they are great source of Fiber. They are also rich in phytosterols which can lower cholesterol levels and some say they might lower the risk of some cancers. What’s not to love about these little morsels of yummy goodness? If your like me and I hope your not you could easily eat them non stop all day long. Interesting thing though. To many of these lovely nuts and they can increase your weight rather quickly. So I think weight watchers has a good guide on how many you should eat or I should say you can eat. For me that comes down to 1 serving a day that comes out to about 40 to 50 nuts a day. More than that and you may find yourself constipated and gaining weight. 40 nuts though are filling. If you know anything about weight watchers they use a point system and 40 nuts comes out to about 4 points…. I haven’t seen these things on the market in years. I really did totally forget they even existed until I seen a picture of them. 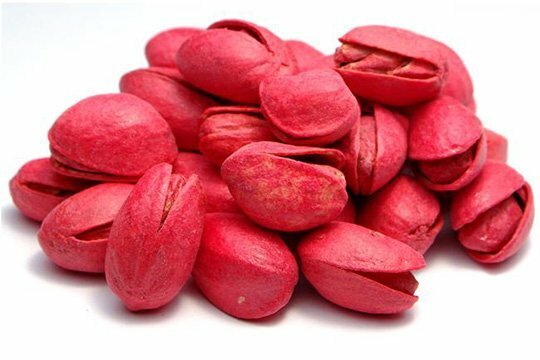 Have you ever eaten Red Pistachio’s? I have done a google search you can actually still buy the red ones. 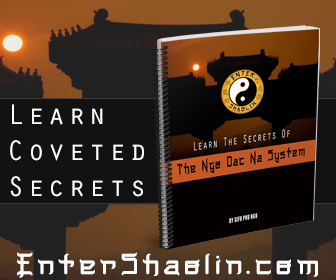 Though I am not sure why anyone would considering all the knowledge we have gained over the past 20 years. Eating anything dyed can’t really be good for you can it? Just to add a little extra effort there are health risk to eating Red Dye 40 so eat anything dyed with that with extreme caution. One of the things that is said to be caused by red dye 40 is A.D.D. which I believe I have. And interestingly enough I ate a ton of food growing up that had red dye 40 in it. Do your research and make sure you know what you are putting in your body as they say you are what you eat.